Matching Band Not Included In Price Of Ring. Can be sold seperately. Contact Us For Pricing. The Beverly Series is highly customizable. We offer the Beverly series in just about all metal types, metal colors and stone cuts! Just contact us today and we will be more than happy to get you a quote in your desired options. Moissanite is a real gemstone, not a fake diamond. It's harder than sapphire or ruby, more brilliant than diamond, and 1/10th the cost. Moissanite is the second hardest gem on the planet! They won't cloud or scratch like a cubic zirconia. Moissanite is the perfect alternative to a diamond! Why spend $10,000 PLUS on your dream ring when you could save that extra money and put it towards your honeymoon, your college loans, or towards a down payment on a house. 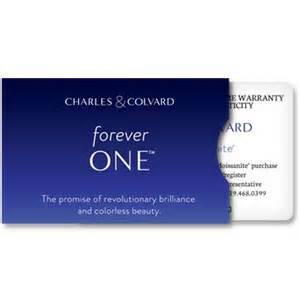 Forever One is Charles & Colvard's new colorless Moissanite. They are graded D-E-F in color. With 10% more brilliance than diamond, Forever One explodes with light. Its WHITE color is perfect in white gold. But we can make most all our rings in any metal color or type you prefer, At 1/10th the price of a comparable quality diamond! - Forever One requires less of an investment to make a more brilliant statement. Oh and there also eco friendly and conflict free! Its a sure bet with Moissanite! The Joan 2.40CT = 8mm Forever One Cushion Cut Moissanite Double Halo Engagement Ring!